Why she gave this to me and not her other five children remains unclear. Perhaps she saw my disillusionment with the rat-a-tat, airless echo of school, the Catholic Church, the Sunday roast dinners and our predictable life. I had been punished a number of times for staring out the school window day-dreaming about who knows what, maybe stink bugs. Then came the thwack of the ruler, held by a tight-fisted, chalky nun who sent me off to kneel on the concrete hallway floor for two hours. I would later go home and draw pictures of nuns being kidnapped, held in dark closets, being starved, begging for mercy. I hid the stories under my bed, accompanying the other stacks, all concerning some level of inequality. During this time, music and freedom called my mother to another place, a more hopeful existence where she wouldn’t be a “wife.” She was a hippy to my father’s buttoned-up businessman. My mother did not have many heroes, as they were fleeting and then dead: Malcolm X, Martin Luther King Jr. and the Kennedys. But there was something about Einstein that settled into her very core, then mine. Thus began my own obsession with Einstein. I tucked these quotes into my grandmother’s jewelry box, which she had given me just prior to her death. And he was a rascal, with wild eyes, the mop of hair, his crumpled clothes. This made him real for the rest of us. I began to collect quotes and read about him in libraries. His humor brought me great comfort. He wasn’t some impervious man one couldn’t access. He didn’t believe in separating himself from others, and in fact loved sharing his ideas, while helping others expand on their own. He was approachable, both alive and dead. As a boy, his father knew little Albert was gifted, and perhaps because the elder Einstein (an engineer) had failed at so many businesses, he insisted his son stay in school. He enrolled him in a school in Munich to pursue engineering, but Albert was frustrated with the educational system. He clashed repeatedly with the authorities, resented their teaching style and wrote about how schools were essentially killing the creative spirit and curiosity of its students. He was 15. “The only thing that interferes with my learning is my education.” When I read this in junior high school, I could finally relax. The simple statement brought along a universe of vindication because I simply could not understand the entire educational process of rote learning. It was too boxed in, too impersonal. I realized I would have to find my own way intellectually alongside the traditional, through books and lectures by Rollo May, Erich Fromm, B.F. Skinner, Timothy Leary and Marshall McLuhan. I was no genius, simply curious and bored with school. Given the number of times my gypsy mother moved us, staying on track in class made me weary. Another school, another teacher, another set of young people I would have to navigate somehow. 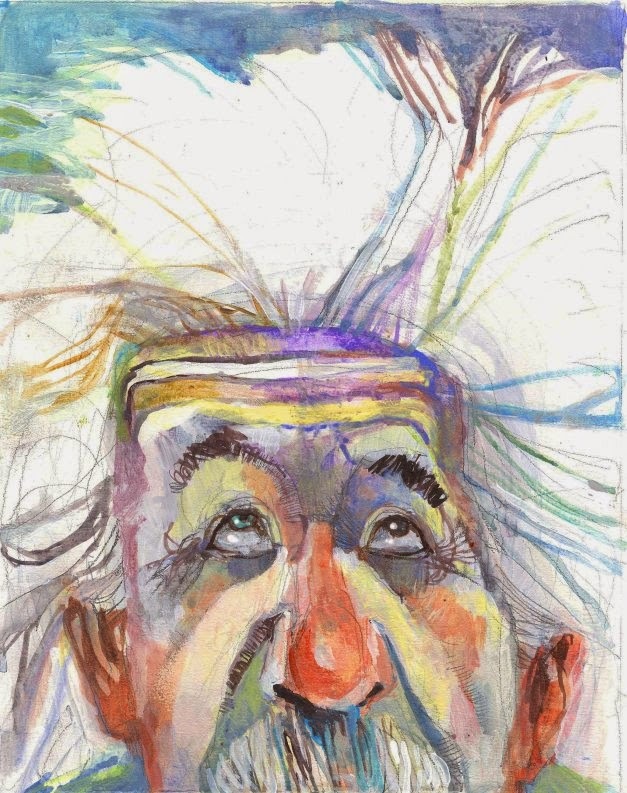 Why has Einstein resonated so deeply with me and so many others? Among the world’s most brilliant minds, he continues to inspire. What of da Vinci, Tesla, Newton, Hawking, Aristotle, Edison, Cervantes? The list goes on. They too share not just powerful minds, but an endless pursuit through curiosity and instinct. They knew knowledge was important, had to be learned, but could only get them so far. The rest is mystery. Einstein embodies the mystery. So many of his ideas, beyond his incredible discoveries in the world itself, which ultimately turned the world on its head, contain room, empty space, air to breathe. His equation, E = mc2, may be the most famous equation in physics, eventually setting the stage for the development of the atomic bomb and nuclear power plants. But had he known where this was going, he said, he should have become a watchmaker. To this day, his theories inspire advances in science, astronomy and physics, as well as from philosophers. I keep a tip sheet of quotes tacked up near my computer and read one every day. It really doesn’t matter which one, as they all carry great meaning. With each read I come away with yet another interpretation. Einstein would go on to fail countless exams when applying to higher learning institutions. Yet, he continued exploring, reading and taking great interest in other’s concepts and ideas. He did eventually get accepted into the Polytechnic in Zurich. He wanted more knowledge and continued developing his own theories and expanding others. He never lost his ability to stay curious, intuitive and of course, humorous. Despite his apparent genius, upon graduation he could not get a job and landed at the patent office, only to be overlooked for a promotion because he had not managed to grasp machine technology. But it was there that the 26-year-old developed further radical notions in his spare time by analyzing various patents. And he never stopped writing about his findings. Finally, with some recognition, he left the patent office, and by 1908 was considered as one of the world’s leading scientists. He went on to become a professor in Prague and Berlin, and ultimately became famous a few years later when his theory of relativity at last made a permanent impression on the world. Ten years later, he was awarded the Nobel Prize in Physics. The entire universe was Einstein’s canvas, and he made this world relatable to all of us. He said so many things and has been attributed for many as well. Of all the great brains, his would be the one cut into 240 pieces, kept in jars, cardboard boxes, often hidden, studied under microscopes. Bits of his grey matter still remain at Princeton University. All those years of cutting, probing and analyzing amounted to little new knowledge of the human mind. Thank you Rhonda for the post. I too felt trapped by the educational system but luckily at the end of my college years, I began reading things that interested me from a variety of subjects. After years of doing this, I can concur that my soul feels richer and I am definitely more intelligent. I ageee, Einstein genius was is passionate pursuit of knowledge.